s YouTube channel. My kids love watching people play games sometimes more than playing the games themselves. So I did a quick search for “dantdm lion king mod” and found the YouTube video that had captured my daughter’s attention. In the comments on the video we are told that the mod itself can be downloaded from this link. And this is where the hazzard comes in. Minecraft does not have an official way to mod or modify the way the program operates. Nonetheless it is a Java application which means it is not terribly difficult to reverse engineer the application and develop hooks or software that can essentially reach into the guys of Minecraft and make it do what you want it to do. 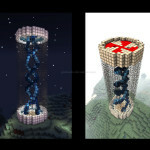 The result is that Minecraft mods are generally distributed on unofficial web forums by an ad-hoc community of volunteers. These volunteers are typically children and teenagers who don’t have much money so they end up hosting their mods on free services. These services typically maintain their free status by serving a copious amount of ads. This mod was no exception. It also didn’t help that I was searching for a copy of the mod for a much older version of the game. All of the links to download the mod files are through adf.ly. It is very easy for malicious software authors to distribute their software by hijacking expired adf.ly links. This is not a new threat but frustrated forum posts from people who have been infected by malicious adfly links are still being made. Several people have wondered whether adfly is itself malware or a part of an overall malware distribution effort. I wouldn’t be surprised if it were. In any case, this provides a good example and lesson for us to learn from when it comes to the hazards that Minecraft modders face.